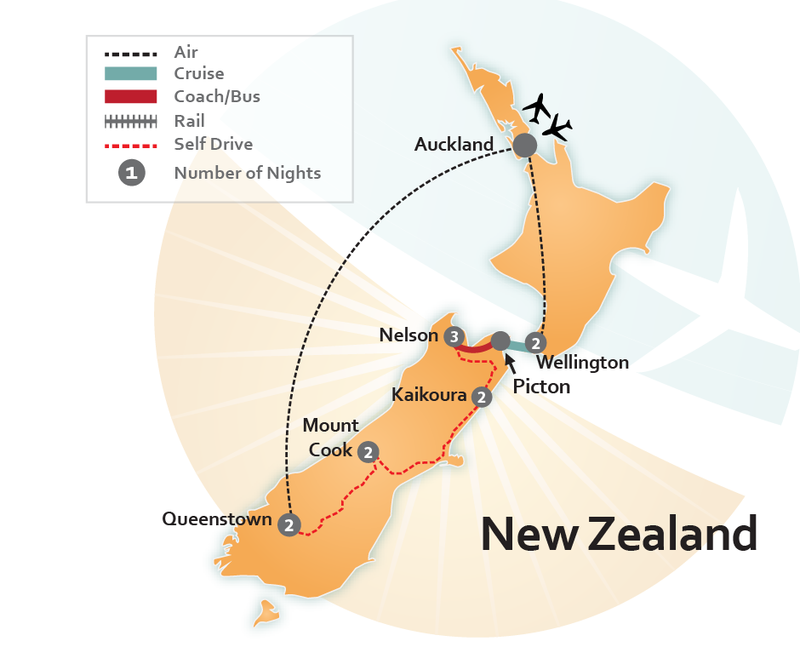 14 Days / 12 Nights – New Zealand. 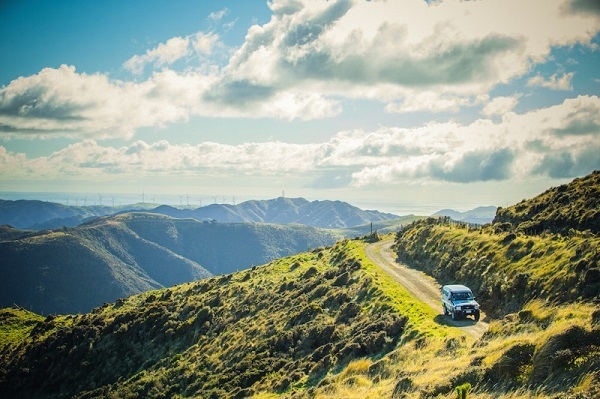 Find yourself taking an adventure that you have been talking about for years with your trip to Wellington, the nation’s capital, and the South Island! 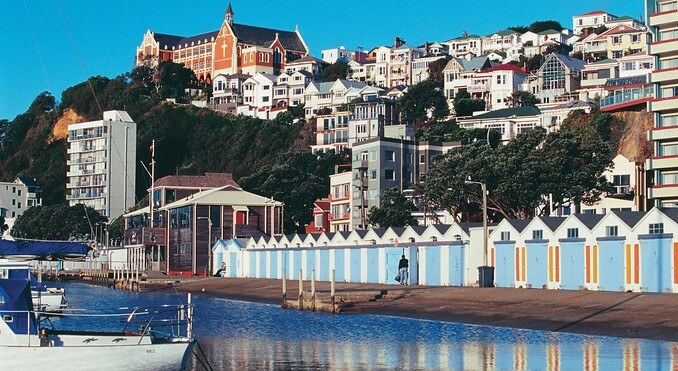 Starting in Wellington, get your bearings by jumping on one of the cable cars to explore the city and take off to the Te Papa museum on the waterfront. We know what you are saying?a museum!?? Yes! 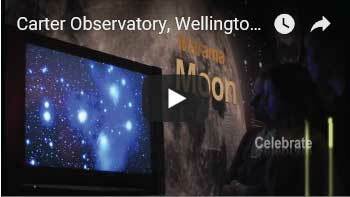 It is a perfect opportunity to understand the history of the country especially so you can see how the Maori culture is interwoven into the current culture. 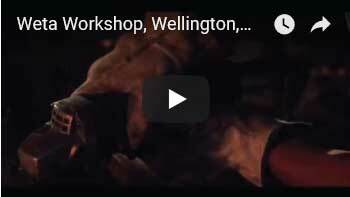 You’ll find a full open day in Wellington with this itinerary to give you the flexibility to design your trip to your desired preference. 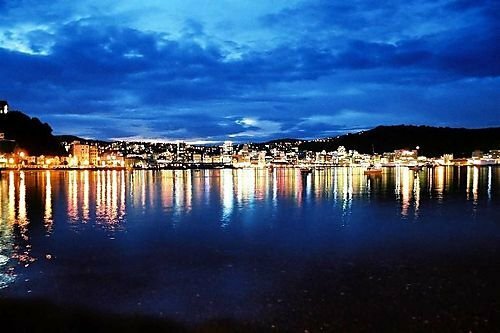 After your two nights in Wellington, you are transferred to the Wellington Ferry Terminal to take a three hour scenic cruise to Picton on the south island. 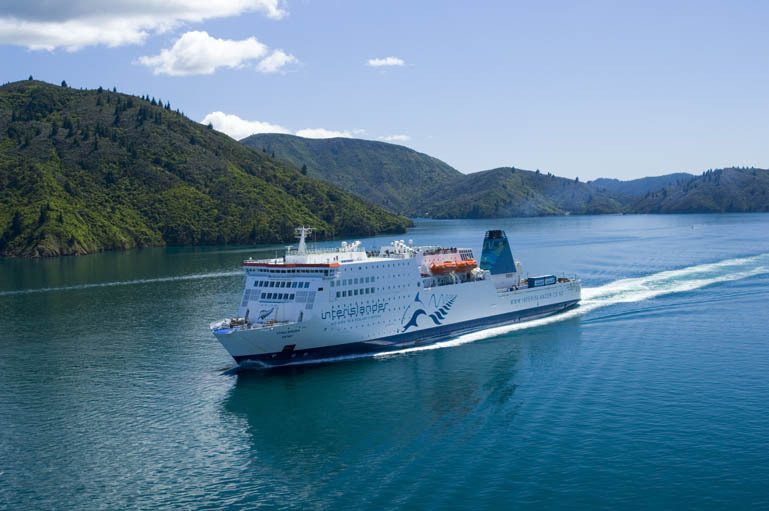 This is just not any plain ferry ride, you are going to be traveling to one of the most beautiful spots across the Cook Strait. 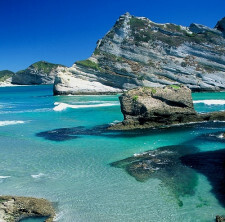 See the beautiful mountain ranges and spot dolphins escorting you to the next island. 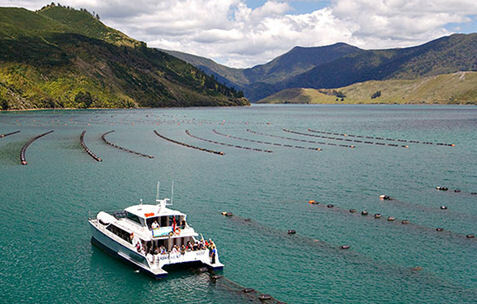 Upon arrival you will begin your mussel cruise throughout Marlborough, the same region where you find Sauvignon Blanc. Enjoy this delicacy with a complimentary glass of wine! 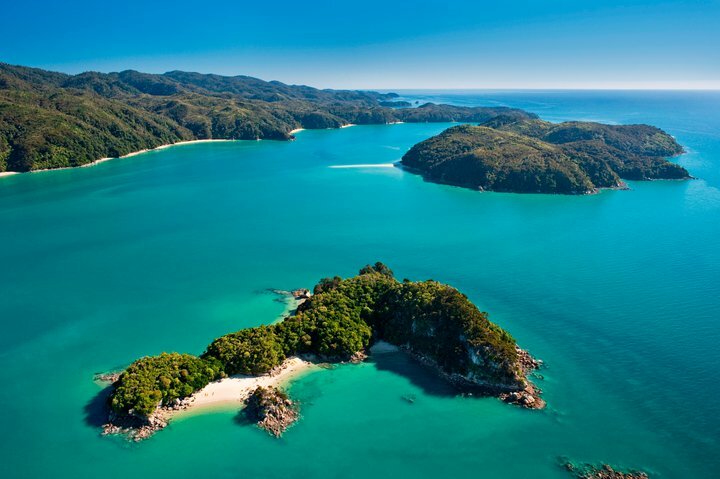 Soon you will find yourself staying Nelson for three nights that will give you two full days to select various optional excursions to the beautiful Abel Tasman National Park. 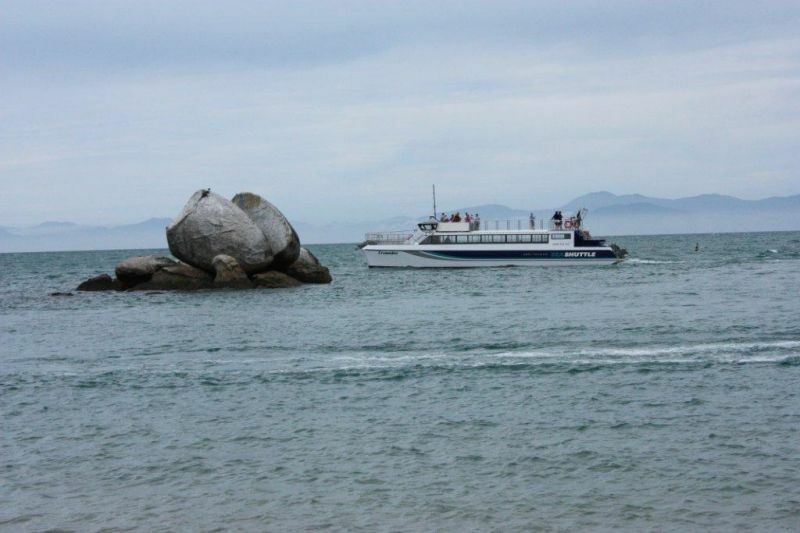 Take a relaxing cruise, hike or kayak through the park. Any option you choose will gratify your thirst for nature. This is where your self-drive journey begins. It is very easy to drive with the wheel on the other side! 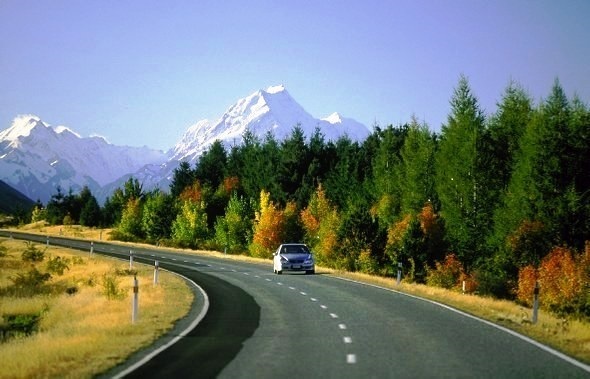 Luckily you will not find yourself in the hustle and bustle of the city with your scenic drive throughout the south island. Drive south to Kaikoura on the east coast where you will spend two nights to partake in the Albatross Encounter Tour. These birds have the largest wingspan on earth! Your journey continues south towards Lake Tekapo and Mt Cook. 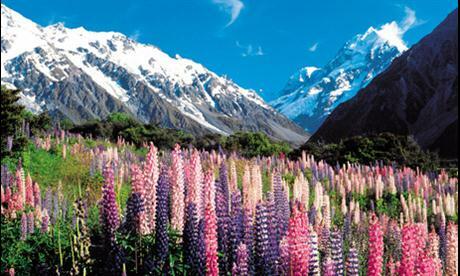 At both locations you will find yourself surrounded by the spectacular landscapes of the Southern Alps! Take in the fresh air and serene views where you will literally get away from it all. 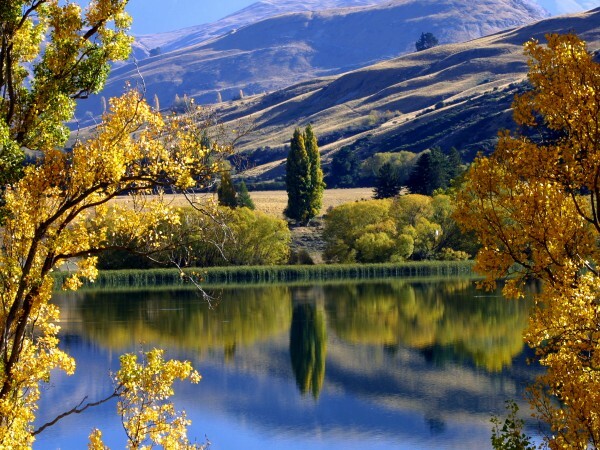 Drive over through the beautiful Otago countryside and find yourself spending the last two remaining nights in Queenstown. 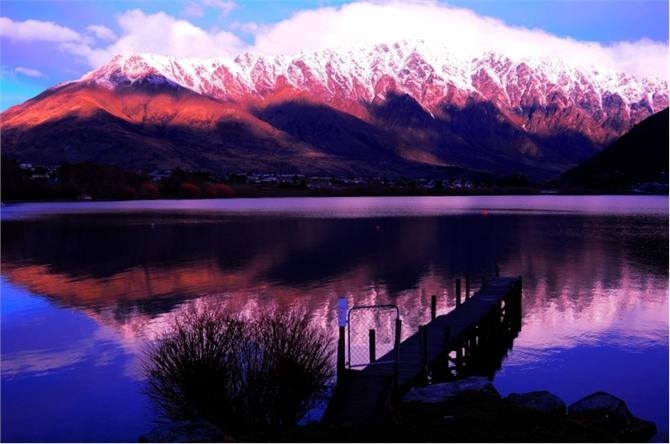 This alpine resort town has so much to offer where you are cradled between the majestic Remarkables, mountain ranges, and Lake Wakatipu. 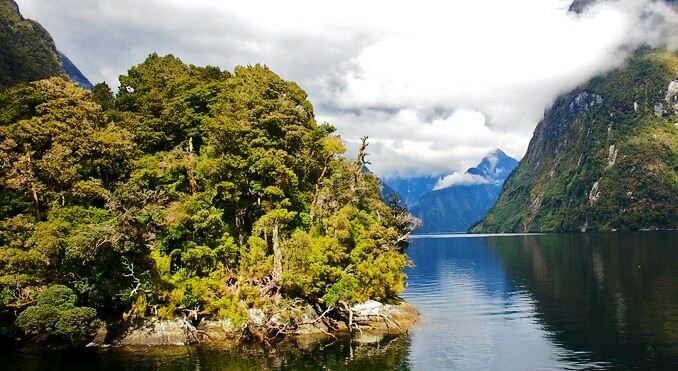 Here we leave you with one of your last gratifying excursions in the Fjordland National Park at Doubtful Sound. You will see serene waters, sea lions, dolphins, beautiful waterfalls. It all feels so whimsical. 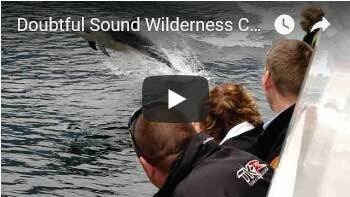 This journey will leave you wanting to come back and you will soon see why! 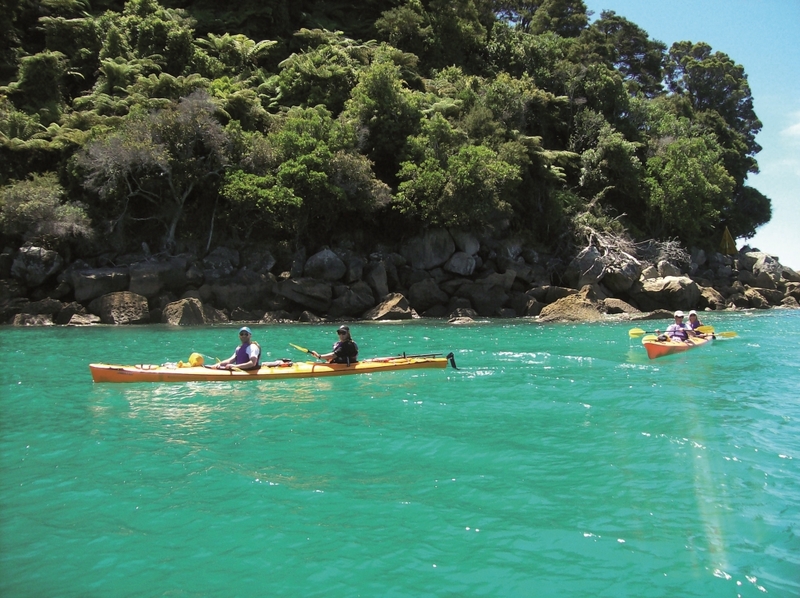 Abel Tasman Water & Walk is for those visitors who prefer faster access into the park by water taxi so that they may spend more time exploring the many features this national park has to offer and discovering there is much more here than anticipated. 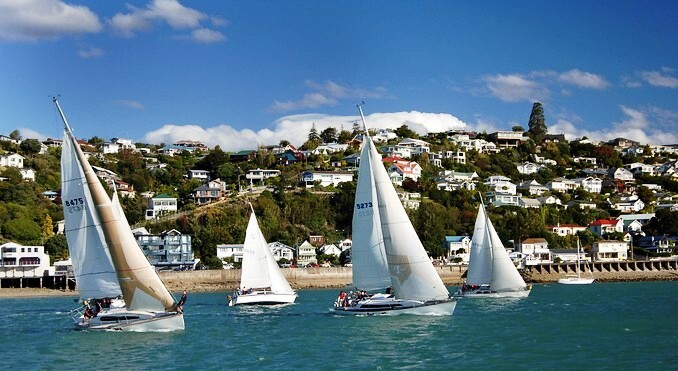 This added value, fully guided journey interprets the less obvious features such as the early settler activity as well as Maori history and the endless stories that abound here, especially from the rich variety of vegetation, birds and aquatic life. Take a scenic cruise into Tonga Island Marine Reserve, pausing to watch the antics at its resident Fur Seal Colony. 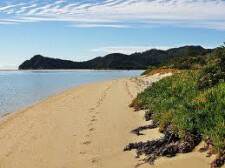 Land at historic Tonga Quarry beach to walk 2 – 2.5 hours (4.1 kms, 2.5 miles) over a forested saddle and around spectacular Bark Bay estuary with its cascading waterfalls. 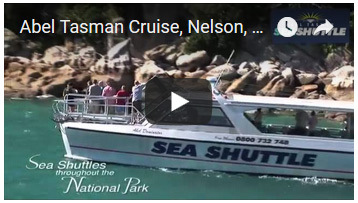 Rejoin the Cruise at the sheltered golden cove, Medlands Beach. 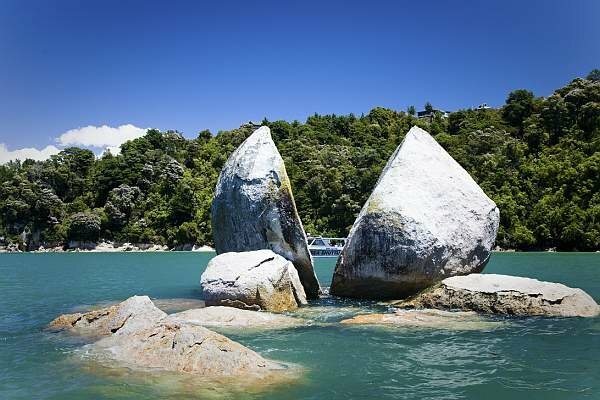 Stay on board the boat to cruise the spectacular northern beaches to Totaranui, then return to Tonga Quarry for your walk to Medlands Beach. 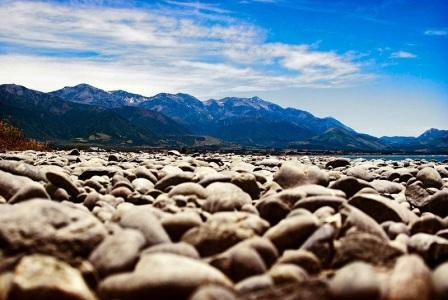 Today Self Drive from Nelson to Kaikoura. 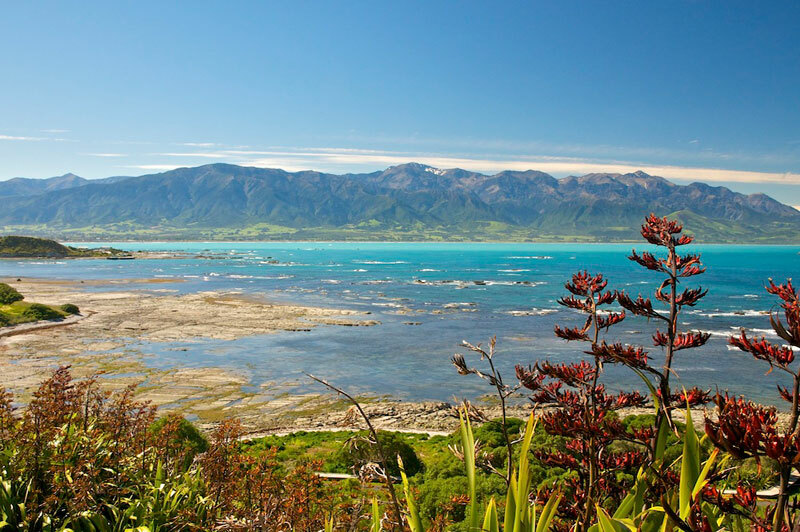 Enjoy the lush green forests and landscapes as you make your way down to Kaikoura. 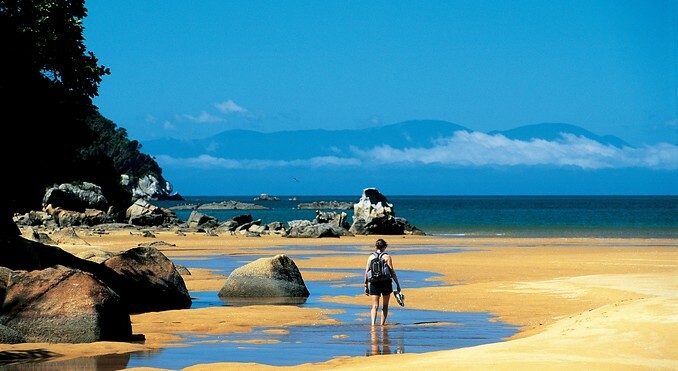 Upon arrival in Kaikoura, take time to enjoy its offshore wildlife and many walking tracks (3.5 hours). 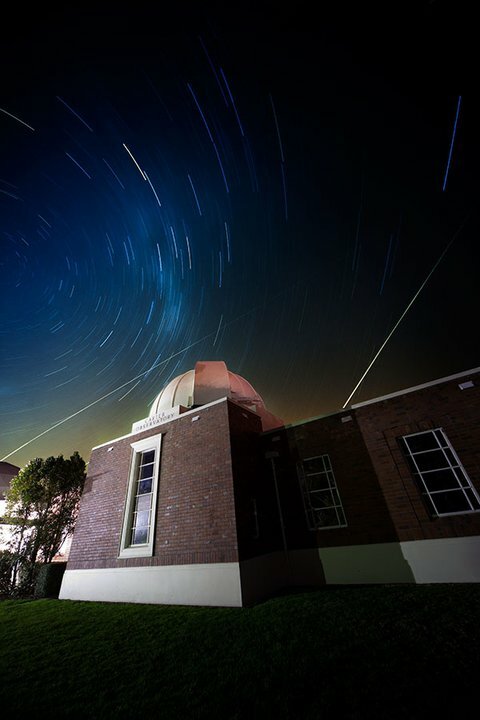 Travel to your accommodation at Lake Tekapo, New Zealand, where you will be staying whilst on vacation for 1 night..
Set near the shores of Lake Tekapo and surrounded by the spectacular landscapes of the Southern Alps, this resort is a glimmering spectacle on New Zealand’s South Island. 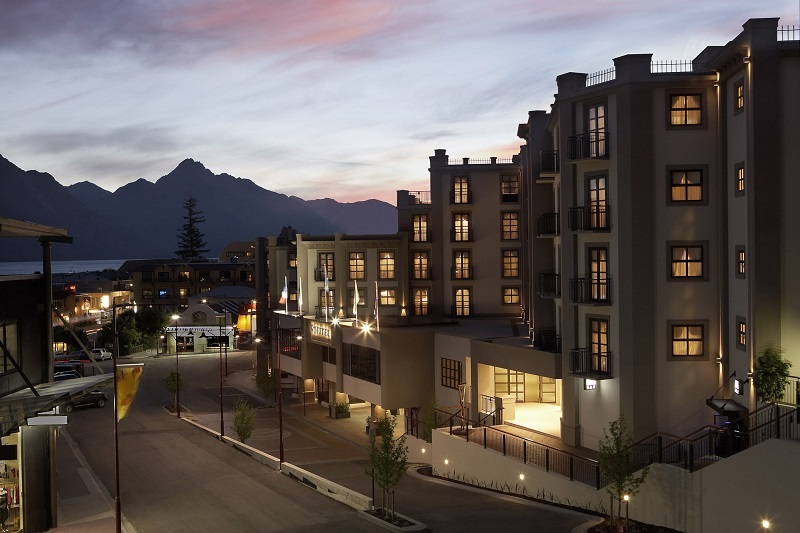 The architectural design of the resort is a reflection of the surrounding Mackenzie Basin landscape and combined with the exceptional facilities and services of this resort, offers the perfect destination for relaxed weekend escapes or as a relished retreat after a hectic day of exploration. Simply unwind and breathe in the serene atmosphere. Relax amongst our cosy sofa at Rakinui Lounge while enjoying a warming drink or light snack and for breakfast and dinner Rakinui Restaurant serves a diverse selection of international standard cuisine and favoured local delights accompanied with a breathtaking view across Lake Tekapo. 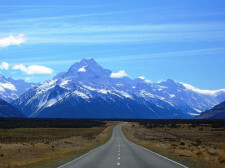 The picturesque road from Lake Tekapo to Mt Cook guides you around beautiful Lake Pukaki and through the Tasman Valley. You cannot help but stop and take photos of the the lakes in this area due to the stunning, unique turquoise colour of the waters which is caused by fine, glacier-ground rock particles. 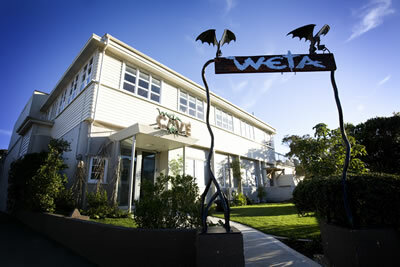 Travel to your accommodation in Mount Cook, New Zealand, where you will be staying whilst on vacation for 2 nights. Your 5 Star vacation accommodation features rooms and suites, most offering private balconies with either spectacular mountain or lake views. All rooms are equipped with Plasma television, CD and DVD player, espresso machine, wireless LAN and an additional LCD television in the bathroom. You have an opportunity to relax from your travel by visiting the day spa, business lounge, library, conference area, bar and restaurant. 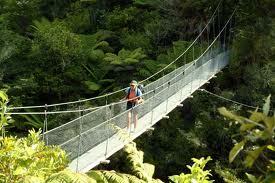 Other activities available include: Bungee jumping, Fly Fishing, Boating, and Golf. 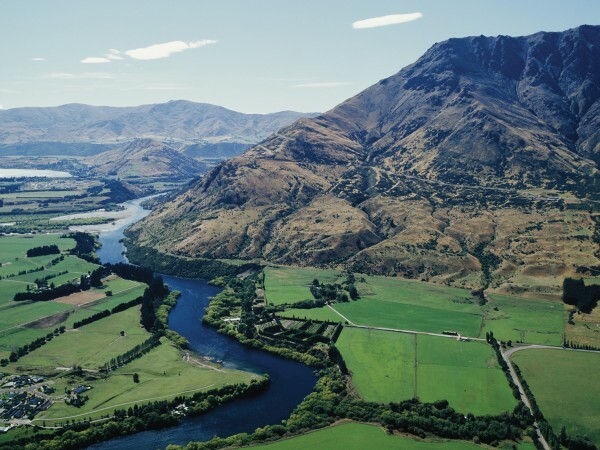 Travel and explore the surroundings by visiting New Zealand’s Milford Sound and Central Otago Wineries. For the nature lover, maybe enjoy a nice stroll on walking trails that meander along the lakes shores. Land Content Only	 $2,738	 $4,233	 International return flights from the USA are not included. Please see detailed itinerary (above) for more information on inclusions. Itinerary can commence any day (subject to availability). Premium (Economy Class)	 $7,805	 $9,300	 Premium Economy Class International Return Flights from the USA (Los Angeles) are included. Change and Cancellation Fees Apply. Subject to Availability. 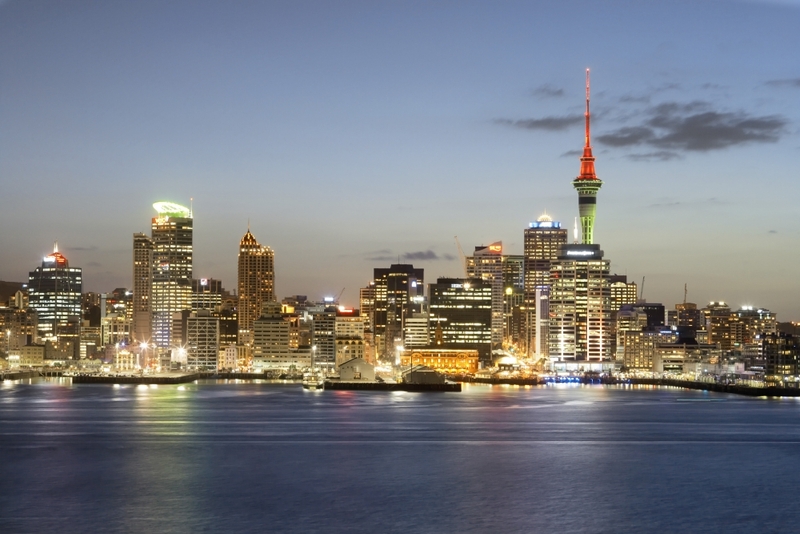 Business Class	 $9,519	 $11,014	 Business Class International Return Flights from the USA (Los Angeles) are included. Subject to Availability. 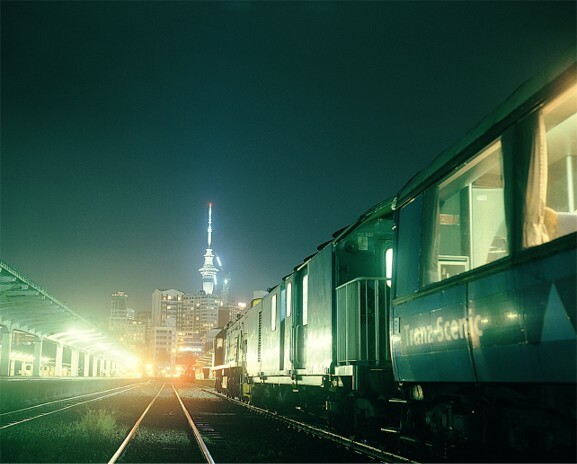 First Class	 $29,282	 $30,777	 First Class International Return Flights from the USA (Los Angeles) are included. Subject to Availability.